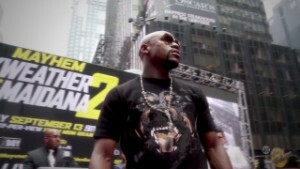 Why do we ignore Mayweather’s domestic abuse? There is something missing here: Amid all this hoopla, as corporations and promoters line up for their big pay-per-view payday, there is a resounding silence on Mayweather’s documented history of domestic violence — no mention of any accountability or responsibility. That Mayweather is a serial batterer of women cannot be disputed. According to the sports website Deadspin, Mayweather has had at least seven assaults against five women that resulted in arrest or citations in addition to other episodes in which the police were called but no charges filed. Some examples: In 2001, he allegedly struck the mother of one of his children in the face with a car door and then punched her several times in the face. 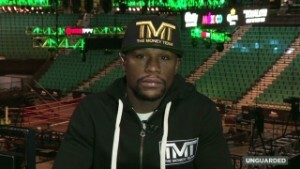 According to an account in the Las Vegas Review-Journal: “Mayweather was charged with two counts of domestic battery. He pleaded guilty in March 2002 to those counts and one count of misdemeanor battery in an unrelated case. For attacking two women at a Las Vegas nightclub in 2003, he was found guilty on two counts of domestic battery and given a suspended six-month prison sentence for each as well as a $500 fine for each count, or community service. In 2010, he attacked the mother of three of his children at her home and punched her in the head. His oldest son called the police. He did a plea deal to domestic assault and pleaded no contest to harassment charges, serving two months of a 90-day sentence. 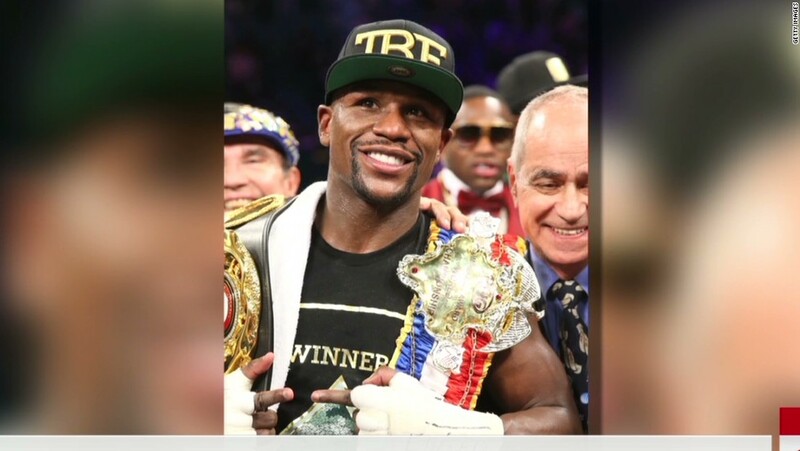 Questioned by CNN reporter Rachel Nichols last year about his abusive behavior, Mayweather showed little remorse. He noted that there were “no pictures … just hearsay and allegations.” He has previously said he should not be compared to O.J. Simpson or Chris Brown because there are no pictures of the women he has allegedly abused — as if the lack of video or photographic evidence is equal to exoneration. In fact, Mayweather spent several months in jail in 2012 after pleading guilty to misdemeanor assault charges. What is astonishing here, however, is that the public is willing to overlook Mayweather’s misogynistic, violent behavior outside the ring. 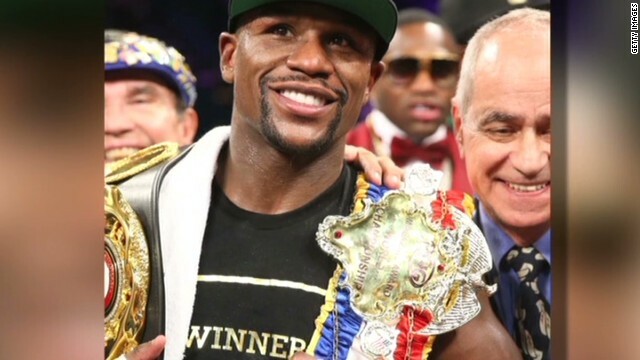 Consider how well all the hype over the Mayweather-Pacquiao fight is paying off. The Los Angeles Times reports that gambling on the fight is expected to be heavy, with one MGM Resorts official estimating the total amount of wagers at $80 million. The 16,800-capacity MGM Grand Garden Arena has sold out, generating a record $74 million. Mayweather, whom Forbes has named the highest-paid sportsman in the world, is set to take home $180 million for the fight. Such collective indifference by the public of Mayweather’s domestic abuse is curious considering other incidents involving football players. After video surfaced of Ray Rice punching his then-fiancée (now wife) in an Atlantic City, New Jersey, elevator, he was temporarily suspended by the NFL and later dropped by the Baltimore Ravens. Adrian Peterson was likewise suspended by the Minnesota Vikings for harshly disciplining his son. These punishments occurred amid widespread outrage among fans and the public over what was deemed unacceptable behavior by athletes. Such outrage seems to be absent when it comes to Mayweather. Mayweather’s history of abuse can be seen as even worse when we remember that he is a professional fighter. He makes millions throwing punches. He earns his living using his fists. The fact that he uses these same fists to beat women does not seem to matter to CBS (which owns Showtime), the MGM Grand, the Las Vegas gaming industry or the sponsors associated with Saturday’s fight. If any of them has made a public statement about his domestic abuse, I have not been able to find it anywhere online. But their seeming embrace of Mayweather makes them complicit in his horrific behavior. This abuser should be a pariah. 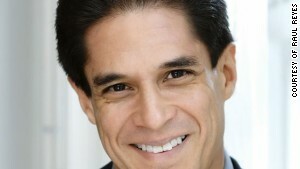 Instead he is celebrated as “boxing’s greatest moneymaker” and a celebrity (he competed on “Dancing With the Stars” in 2007). Sure, some sports columnists have called Mayweather out for his violent rampages. Yet these reports have not resonated with the public in a meaningful way. Meanwhile, domestic violence remains an epidemic in the United States. According to the Centers for Disease Control and Prevention, 4.7 million women experience physical violence by an intimate partner each year.Nearly one in four women have been a victim of physical violence by an intimate partner in their lifetime. As troubling as these statistics are, the reality is likely uglier, as domestic abuse is widely considered to be an under-reported crime. At its best, a boxing match can be thrilling, artistic and mesmerizing. Unfortunately Mayweather’s longstanding domestic abuse issues tarnish both the sport and the fans that choose not to hold him accountable for his behavior.